LimoWiz sends a credit card transaction to the secured payment gateway, and within a second reports back whether the transaction is approved or declined. If approved, LimoWiz records the payment and prompts you if you wish to email a payment confirmation to card holder. The payment gateway later batches all credit card transactions processed throughout the day and deposits the sale into your business bank account within 24 to 72 hours (depends on bank). The discount rates vary among merchant services, therefore, we give you several choices. Once your merchant account is approved and ready for integration, the merchant services company will email you your credentials to save into LimoWiz. Now you are ready to process credit cards directly from LimoWiz. You can process a Sale, Pre Authorization, Post Authorization, Void and Issue Refund. It is really that easy and no terminal is required! NOTE: The merchant account must be established at one of the above companies to utilize credit card processing from LimoWiz. In order to receive proper integration credentials, make sure you specifiy that you are using LimoWiz. LimoWiz only works with above authorized gateways. 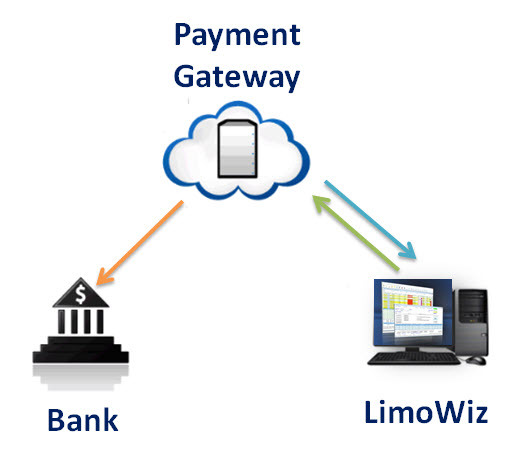 LimoWiz will only integrate with the above gateways; no additional integrations will be added. ** LimoWiz Authorize.NET integration is FREE if you sign up here; otherwise, integration cost is $395.00. Instantaneous credit card number verification during input with optional pre-authorization to guarantee funds. Encryption of all credit cards stored in LimoWiz data bases to ensure compliance with credit card standards. Securely perform various types of credit card transactions: Sale, pre authorize, post authorize, void a sale, and issue credit. Return the result of the address verification whether customer billing address and zip code are correct. Passing correct billing address will guarantee the lowest discount rates. Process a "Sale" for one trip or multiple trips using one single credit card transaction which will save you card transaction fees. Uses your high speed internet connection. No phone lines required. Get rid of that expensive terminal. Guaranteed lowest overall processing costs. Prompt response from a highly trained and low pressure merchant consultant. One of the highest approval rates in the industry. No application, programming or set up fees! Process sale, void, pre-auth, post-auth, credit and void credit card transactions. No more data entry errors. LimoWiz will verify all credit card numbers before you even process the sale..
LimoWiz will process a credit card and immediately tell you whether the transaction was approved or declined. If approved, LimoWiz records the payment and either emails a secure receipt (with only the last 4 digits of credit card number) or send a payment confirmation via email to the card holder. Look up and print detailed reports and a break-down of all transactions types. You do not need a terminal anymore! Works directly from LimoWiz to process credit cards. You can process a sale, pre-authorize, post-authorize, void, and issue refund. Gateway will always work with LimoWiz without any incompatibility issues. Easy online account setup and configuration. No software to install. Online merchant account access to review or search submitted transactions. You can access it from anywhere and process credit using their Virtual Terminal, if needed. Auto close of batch at a certain specified time. Get daily email of batch totals. Export transactions from your Gateway account to various formats.